It happened to Europe last year. A persistent erosion of Arctic sea ice set off changes to the polar jet stream that locked in place a severe winter weather pattern that pummeled the central and western European countries for much of the winter. Storm after storm piled snow high in locations that typically saw only modest winter precipitation while other areas were simply buried. The US also took a glancing blow from this extreme storm configuration. But now, with a large trough in the polar Jet remaining locked in place for almost a year, the US from the Rockies eastward appears to be in the line of fire for some very severe winter weather. In other regions from Alaska to Eastern Europe, record or near record warmth and dryness have settled in with a large swath of eastern Europe showing average temperatures more than 6 degrees Celsius above the seasonal average. Over the extreme northern Pacific, adjacent to Alaska and the Bering Sea, seasonal temperature range from 4-12 degrees Celsius above average. And it is this extreme northward invasion of warm air that is displacing polar and Arctic air masses toward the east and south, putting much of the US in the firing line for strange and severe winter weather. Just this week, the tale was one of record ice storms throughout the central and eastern US with hundreds of flights cancelled, deadly traffic pile-ups, and holiday shopping disrupted. On the east coast, from Virginia to Maine, workers and shoppers alike were treated to three days straight of snow turning to sleet and freezing rain and then turning back again to snow. With storms like these hitting in early December and with the pattern in the Jet Stream taking on such an extreme configuration, it appears possible that the winter of 2013-2014 could be a very, very stormy one indeed. To understand how human caused global warming can make winter storms more severe in some areas while other areas hardly experience winter at all, one should first take a look at two major governors of Northern Hemisphere weather: the circumpolar Jet Stream and Arctic sea ice. An extreme difference between the temperatures at high northern latitudes and at more temperate latitudes has driven a very rapid flow of upper level air called the Jet Stream for almost all of human meteorological reckoning. This high temperature difference drove powerful upper level winds from west to east. These winds tended to modulate only slightly and when they did, powerful weather events tended to occur. Locking a greater portion of this cold air in place was the northern hemisphere ice cap, most of which was composed of a large swath of sea ice covering much of the northern oceans. This high volume of cold, reflective ice kept temperatures up north very, very low and provided the massive temperature differences which kept the Jet Stream predominantly flat with only occasional and more moderate severe weather causing ripples and bulges. But since 1979, massive volumes of sea ice have been lost due to an immense and ongoing human caused warming trend taking hold in the Arctic. As human greenhouse gas emissions sky-rocketed, Arctic temperatures rapidly increased far faster than the global average. By this year, human greenhouse gas emissions had driven CO2 levels to the highest seen in more than 3 million years while Arctic temperatures are now warmer than at any time in the past 150,000 years. Sea ice retreat has been equally unprecedented with average winter values now 15-20% below extent measures seen during 1979 and with end summer sea ice extent values now a stunning 35-50% below that of 1979. Sea ice volume, the measure of total ice including its thickness, has shown even more stunning losses since 1979 with seasonal winter values 30-35% lower than in 1979 and end summer values between 65 and 80% lower during recent years. The loss of hundreds of thousands of square kilometers of sea ice radically reduces the Arctic Ocean’s ability to keep the Arctic cold. To the contrary, we see larger areas of open water that, in turn, radiate ocean heat into the atmosphere throughout winter. As a result the temperature difference between the Arctic and temperate regions is less and this, in turn, slows down the Jet Stream. When the Jet Stream slows, it tends to meander. And when it meanders it creates very deep troughs and very large ridges. In the ridges, we get unseasonably hot temperatures along with increased risk of drought. And in the troughs, Arctic air swoops down to collide with warmer, moist air in a series of powerful storms. During the summer time, the hot, dry zones can bring deadly heat waves, record droughts, and major wildfires while the cooler stormier zones can bring epic rainfall events or even link up with tropical cyclones to result in highly severe hybrid storms. During the winter time, the hot zones can almost completely obliterate the winter season, while the stormy cooler zones can result in snow storm after snow storm. Note the strong multi-channel ridge to the south of Alaska and to the west of Canada diving down into a deep trough with convergent upper level air flows over the central and eastern US. On the map, we also see powerful ridges and correlating warmer regions over Europe, Central Asia, and the western Pacific. These large meanders are now typical to the highly weakened Jet Stream pattern we have seen in recent years due to loss of polar sea ice. Global temperature maps also show anomalously warm temperature departures for much of the Arctic as well as for regions beneath these powerful jet stream ridges. Note that the only northern hemisphere region showing strong anomalously cool conditions is a large swath adjacent to the large trough over North America and southern Greenland. Temperature averages in the Arctic region of Kamchatka, the Bering Sea, the Chukchi Sea and Alaska have ranged between 11- and 12 degrees Celsius above average for the first week of December with much of the Arctic showing 4-12 degrees Celsius above average readings. The US and southern Canada, conversely, have shown temperatures 4-10 degress Celsius below average. It is also worth noting the massive swath of 3-12 C above average temperatures stretching all the way from the Middle East to the west coast of Greenland. Overall, the prevalence of high latitude warmth and a continued high amplitude Rossby wave pattern trough over much of the US is a very conducive pattern for severe winter weather over the coming weeks. Most likely, this pattern will continue to persist through at least early to mid winter. So for the US and especially from the Rockies to the east coast, a progression of strong storms is likely to continue as winter advances. Quasi-resonant amplification of planetary waves and recent Northern Hemisphere weather extremes. Reblogged this on The Secular Jurist. Hello Steve. Good to see you about. I’ve added papers related to this issue. The content and quality of the research continues to progress. That said, this is still a new field and, once entirely validated, it is likely that a new regime will have taken hold as larger volumes of ice melt create another, related but markedly different variety of extreme weather event. From the above information we can assume that the warmer arctic due directly to global warming from CO2 is the direct cause of the increase in Jet Stream fluctuations. Explained simply by the higher the temp difference between high and lower latitudes the greater force keeping the jet stream in a fast and steady course, the opposite is now the norm. My question is, since we are assured now that CO2 will continue it’s faster rise, the arctic will melt faster and the forces that keep the jet stream up to speed and on a steady course will decline faster and faster. What do models tell us the jet stream will be like when we reach ice free summers, and with ice free summers, we can assume even more rapid warming u there. How out of whack can the jet stream get, could it ever collapse and just go random in all directions at a very slow rate of speed. Sort of like Puff, it’s gone out! No real jet stream to speak of, what then. Could the arctic begin a massive heat up and temperature differences become small enough to kill off a ribust jet stream setting up again? Another way to think of it is that the poles warm first and fastest. But at some point there is a strong negative feedback as the ice begins to rapidly melt, slowing or slightly reversing the Arctic temperature increase as the ice releases its stored cold. 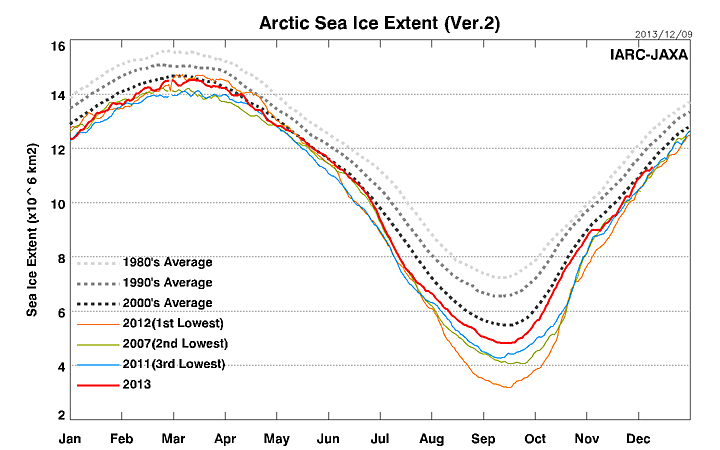 So you end up with a see-saw affect in the Arctic that is very unstable. In addition, the center of cold air will change from a polar orbit to a more lopsided one (offset to Greenland). The result will be very unstable weather and radical changes to the Jet which will continue to be mangled by the forces of human caused change in ways that are entirely non-linear. It is worth noting that the studies showing Jet Stream weakening due to polar amplification have yet to be proven in the scientific consensus. That said, weakness/blocking patterns in the Jet Stream has been predictive for various extreme events over the past few years and have also occurred in conjunction with high level heat anomalies in the Arctic. Critics of Francis and other polar amplification studies note that Francis has not proposed a mechanism and only relies on correlation. This is not entirely true. The mechanism proposed involves the basic dynamic that drives the Jet Stream — difference in temperature from north to south. Francis proposes that the mechanism of higher relative heat content at the poles tends to slow the Jet Stream down, resulting in various weather changes — including more persistent weather patterns. For my part, it seems to me that the Jet Stream model is predictive — at least to the extent that high amplitude Rossby type waves have coincided with extreme events as well as a number of powerful warm air invasions into the Arctic. There is a flurry of study ongoing regarding this subject. So we should see quite a lot of confusion over the coming years as different studies attack the issue from different angles. It generally takes about 20 years for a consensus to develop. In my view, by that time, the trend will have changed to a melt-driven weather dynamic rather than a heat driven weather dynamic. Ironically, there’s more support in some of the models for a melt driven dynamic. Oh, and one more thing to think about… The term mechanism can also be used to refer to a proposed physical mechanism that creates the proposed changes in a given model run. In my view, the models, no matter how well done, are simulations and that observation should hold sway — not model results. Can you describe the effects around the equator and in the Southern Hemisphere? Are there any writings on it? The dynamics at the equator and within the southern hemisphere will be different. For one, the south polar ice sheet will, likely (according to models) be slower to respond than the northern hemisphere ice sheets. Nonetheless, polar amplification will probably have a similar effect on jet stream patterns initially. Large melt pulses from west Antarctica, according to model runs, are shown to have a similar dynamic to that of Greenland but on a slower time-frame (depending on aggregate rate of ice sheet response). The equator will see slower increases in temperatures but a higher frequency of extreme drought, heatwave, and precipitation events. There is a moderate to high risk of increasing tropical cyclone severity with the potential for very severe storms at the end of the model run period. Cyclone forecasts are uncertain due to added atmospheric factors including the potential for increasing atmospheric dust. However, increasing water temperatures at the equator will likely drive more powerful storms when they do form and result in an increasing length of seasons during which storms can form. Some basins will probably see year-round cyclone formation (this appears to already be happening in the Eastern Pacific). As polar amplification ramps down with increasing ice sheet melt more heat concentrates in the tropics and at the equator. So increasing risks for more rapid rates of temperature increase occur at around the three decade horizon onwards. It is worth noting that there is now consensus among the scientific community that droughts and heatwaves are increasing in frequency, while the flood issue is still up in the air (community consensus still divided on the issue). It is likely, should current trends continue, that more consensus on increased floods will develop over the coming years. The research supported by Francis and Masters is also still rather new and controversial. So it will take time for consensus to develop. From a risk standpoint, there appears a high likelihood that Francis and Master’s analysis is correct and should be taken into account for current and future forecasts. A new study for the first time found links between the rapid loss of snow and sea ice cover in the Arctic and a recent spate of exceptional extreme heat events in North America, Europe, and Asia. The study adds to the evidence showing that the free-fall in summer sea ice extent and even sharper decline in spring snow cover in the Northern Hemisphere is reverberating throughout the atmosphere, making extreme events more likely to occur. The study, published Sunday in the journal Nature Climate Change, is the first to find correlations between rapid Arctic warming and extreme summer weather events, since previous research had focused on the links between Arctic warming and fall and winter weather patterns. The Jet Stream studies are shaking up the mainstream a bit. Good. It will be worthwhile seeing a real scientific debate as opposed to the usual scientist versus climate change denier nonsense. Although the cold temperatures in the central and western contiguous U.S. have been remarkable this past week, the coldest since December 1990 for portions of California and Oregon, they are not as anomalous as the amazing warmth that briefly affected the Arctic region of Alaska. At around 9 p.m. local time on December 7th the temperature reached 39°F with rain falling at Deadhorse, the airport that serves Prudhoe Bay on the shore of the Arctic Ocean. This was the warmest December temperature ever measured at the site since it was established in 1968 (actually there have been three sites in the Prudhoe Bay area since 1968: Prudhoe Bay ARCO site 1968-1986, Prudhoe Bay WRCC/GHCN site 1986-1999, and the Deadhorse Airport site 1999-current). Prior to the 39° on Saturday night, the warmest temperature measured during December at any of the three sites was 35°F (1.7°C) on December 31, 1973 at the ARCO site. All-time December warmth records were also set or tied at Barter Island AFB (Kaktovik) which reached 37°F (2.8°C), tying its record for the month last set also on December 31, 1973 (POR 1949-current) and Wainright (POR since 1949) with a 32°C (0°C) reading (previous record 30°F on Dec. 1 and 2, 2006 and December 9, 1963). Barrow, which has the longest POR (since 1921) of any site on Alaska’s Arctic Ocean shore, reached 30°, short of their December record of 34° set on December 9, 1932. Checking the December data for ALL of the Arctic shore sites in Alaska (Barrow, Kuparuk, Prudhoe Bay (Deadhorse), Barter Island, Colville Village, Nuiqsut, Wainwright, and Point Lay) it appears the 39°F reading at Deadhorse was the warmest December temperature ever observed at any site along the shores of Alaska’s Arctic Ocean. Some RAWS sites along the Dalton Highway south of Prudhoe Bay measured temperatures into the 40°s according to Rick Thoman of NWS-Fairbanks. Three years of observations by ESA’s CryoSat satellite show that the West Antarctic Ice Sheet is losing over 150 cubic kilometres of ice each year – considerably more than when last surveyed. The AGU meeting is throwing off all sorts of new information , and none of it is good news. Previous estimates put the amount of heat accumulated by the world’s oceans over the past decade equivalent to about 4 Hiroshima atomic bomb detonations per second, on average, but Trenberth’s research puts the estimate equivalent to more than 6 detonations per second. Can you give a good summary of what’s going on over at AGU? Nose deep in another methane post which, though I hope it doesn’t, will probably piss someone off. Not feeling quite as depressed for some reason. Maybe comfortable denial has re-asserted itself. The temperatures in northern Sweden have been on a roller coaster so far this month. One site, Nikkaluokta saw its temperature fall from 4.7°C (40.5°F) on December 3rd to -40.8°C (-41.4°F) on December 9th only to then rise to a maximum of 7.7°C (45.9°F) on December 11th, an amazing rise of 48.5°C (87.3°F) in just under 48 hours! 2018 to see Third Consecutive Mass Coral Bleaching Event for the Great Barrier Reef?